I have the most amazing giveaway today. I’ve been hinting for weeks that I had an amazing giveaway for my readers and the day has finally arrived! I can finally unveil the most amazing giveaway that has come to Sew Woodsy! Back in March I was approached by Bedding Style and I instantly said yes to the offer! This could not have come at a better time since we are in full swing with our Master Bedroom Revamp Project! If you guys remember it took us over a year to pick out our blue comforter set, so when I was told to pick out a set immediately I panicked. Mr. Woodsy like to have the say in decorating and designing our home. So to streamline the process I picked out my top 5 comforter sets and then showed them to Mr. Woodsy. This honestly took a week and after I was tired of waiting around for his decision I made an executive decision and went with the City Scene Tree Top by Revman Tree Top. I love the contemporary design and I figured it would be a nice contrast to our current crazy busy comforter. Yep, that’s right our comforter is REVERSIBLE! So it’s like a 2 for 1 when we get bored with one side we flip it over and enjoy the other side! I’m so excited to now have 2 comforters for our massive king bed. If we don’t want the busy comforter we aren’t stuck with it–we can switch it up each month changing the look and feel of our room! Use rafflecopter below to enter to win a $250 credit to Bedding Style! Disclaimer: I was provided a $250 credit to BeddingStyle.com where I chose a King Comforter Set and Sheets. 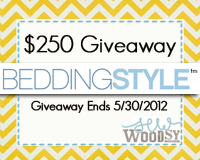 1 Blog reader will have the same opportunity to receive a $250 credit to BeddingStyle.com. I was not paid to write this post. All opinions are always my own! There is an affiliate link in this post. I love the all white bedding. I am having a hard time just picking one…now I know what you went through. Fantastic Giveaway! I would be thrilled to win. 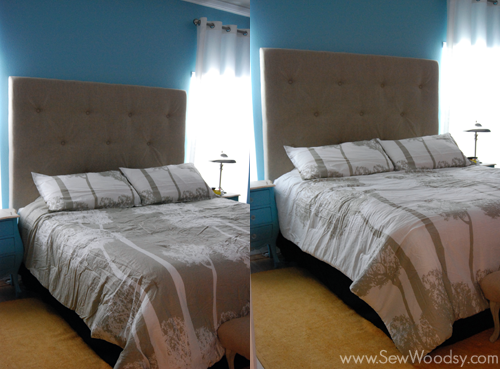 I would love to win this and jumpstart our bedroom makeover! I love the Nicole Miller Argos Apple. So pretty. There are so many gorgeous comforter sets on that website so hard to pick just one! The rooftop terrace set by Tommy Hiliger is really appealing though. Love the Perry Ellis Asian Lilly set – so beautiful! Marimekko’s Lumimarga would have won in a heartbeat for me. Love your choice, too, though. I would choose the city scene Luna. They really have some pretty stuff. Lots of pretty stuff!!!!! I LOVE Laura Ashleys’ Emily bedspread. beautiful. Thanks for the chance to win. I like the Tommy Bahama Orange Cay bedding set because it is very colorful and tropical. I really like the Vera Wang Dusk collection! I need new sheets, so I’m loving the Laura Ashley Ivory Sheet Set. Love the Manor Hill Lark bedding set! It has gorgeous chocolate covers and looks really luxurious! I would choose Patti LaBelle’s Night Birds. I love the green! It looks elegant without being too ‘fancy’. Love the Asian Lilly comforter by Perry Ellis! I like the Nautica Chatham quilt! Great giveaway! I love the Perry Ellis – Asian Lilly set. It looks great! I would have a hard time choosing as well, eek! I would enjoy, and love the opportunity to choose a different color or pattern for my bedroom. I love Argos Apple by Nicole Miller! It has a contemporary feel yet the design gives it an earthy texture. I love the steve madden juliet bedding set! I really like the All American Denim by Tommy Hilfiger. Oh jeeze. I need to actually redo my entire bedroom so I have NO idea where I’d start ! I love the Laura Ashley Caroline Quilt! I love the Manor Hill Lark comforter. I also really like the one you chose. I love the addison bedding. Thanks for the chance to win! What a little dream it would be, to win $250 to Bedding Style! Fabulous Giveaway! Thanks for the giveaway! I love the Marimekko designs! We desperately need new bedding! I am in DESPERATE need of new bedding!! I’m loving the Nicole MIller Argos Apple, but there are so many choices, it’s hard to narrow it down! Jaida, Cleo Sapphire and Hilfiger Stripe! I’m hoping to buy a new house soon, and I’d love the Nautica Prospect Harbor set to put in the guest room! So hard to pick just one! Hard decision. Pretty stuff! I love the Cape Cod comforter by Tommy Hilfiger! So trendy! I love the quilts, steve madden sanibel comforter set and the city scene comforters. I love the Vera Wang Dusk! I like the Tommy Bahama Broadmoore bedding! I like the nicole miller’s argos white bedding. the hubby and i love rhe aqua and chocolate set. Oh I love the Laura Ashley Glenmoore comforter! Beautiful! i am now working on my sons bedroom and am going to have to buy him a new mattress. so this would really not only a great thing to win but a very needed and useful thing. thanks for this chance.